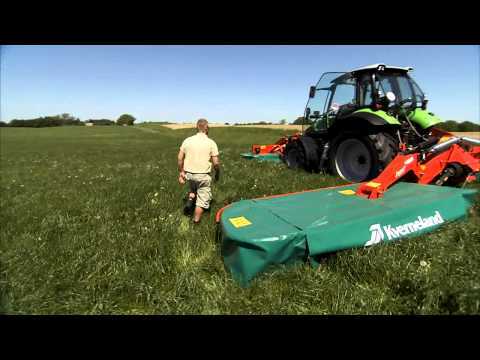 Kverneland 5087 M-5095 M is the perfect machine for the ever growing number of cattle farmers looking for an effective solution enabling them to mow extensive areas with a relatively small tractor. Designed to match the needs of large-scale mowing, these machines are packed with features to meet all demands. The centre suspended mowing units, in combination with the round discs, offer unmatched mowing performance. With the new parking device, storage of the Kverneland 5087 M - 5095 M is easy and convenient, requiring minimum space during winter storage. The Kverneland 5087 M - 5095 M are firmly parked on a strong and stable parking foot, bringing the total height below 4m. When turning on headlands the hydraulic cylinder, which is also used when going into transport position, ensures ample clearance to the swath, so they remain undamaged. 5087 M can be adjusted for optimal operation according to different circumstances, such as field contours or working width of the front mounted mower. The Kverneland 5087 M and 5095 M are an eco-friendly, energy saving solution able to work on tractors with as little as 120 hp. The low weight of only 1360-1500kg, together with the ideal weight distribution that butterfly combinations offer, give the optimum combination of low power requirements, low weight and high efficiency. The highly responsive kinematics incorporated into the headstock design will intervene to protect the mower when encountering even the smallest obstacles during operation. To offer maximum protection and lessen the shock loads on the complete machine, the cutterbar will move backwards and up, letting any obstacle pass without risk of damage.